In a chapter of his memoir, On Writing , Stephen King describes a magnificent writing desk that he placed in the center of his study, as if to tell the world, "THIS is what this room is for! Writing!" Eventually, he set up a bunch of living room furniture in the room, replaced his big, dead-center desk with a little one in the corner, and let his kids hang out while he worked. The lesson: "Life isn't a support system for art. It's the other way around." 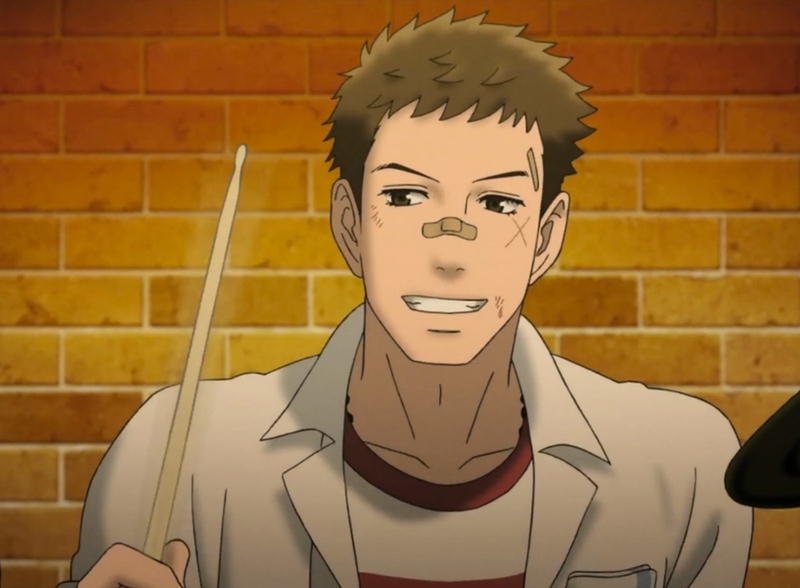 In the 2012 anime series Kids on the Slope , based on Yuki Kodama's josei (women's) manga series, music serves as an essential support system for life, a powerful connection that reaffirms the bonds between its characters. And while some fans who watched it during the simulcast on Crunchyroll disparaged the show for its focus on the lives of its characters over their musical performances, I have nothing but praise for this beautiful coming-of-age tale. 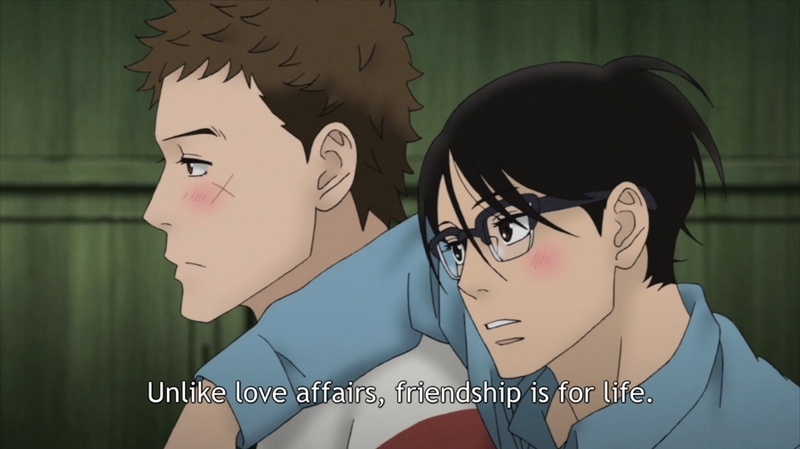 In Kids on the Slope , music serves as a powerful connection that reaffirms the bonds between its characters. Directed by Shinichiro Watanabe, the man behind the musically charged action series Cowboy Bebop and Samurai Champloo , Kids on the Slope follows Kaoru, a Japanese high schooler in 1966 who suffers from a form of social withdrawal. A lifetime of transferring from school to school has left him perpetually afraid of rejection from his classmates, and Kaoru does not expect any outpouring of kindness from his newest peers. But when he has a run-in with local delinquent Sentaro, he finds himself drawn into the world of jazz music. Sen is a jazz drummer, and with the prodding of the pretty class representative Ritsuko, Kaoru lends his classical piano skills to the motley crew of musicians jamming in the basement of Ritsuko's father's record shop. 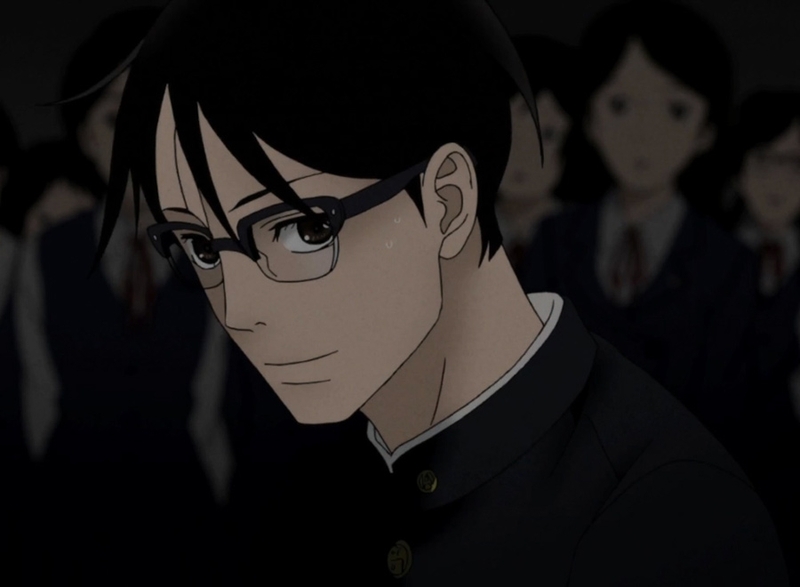 Instead of focusing on the progression of its protagonist's musical talents, however (a path well-tread by Beck: Mongolian Chop Squad ), Kids on the Slope trains an eye on the relationships between its characters. What starts as a simple crush (Kaoru likes Ritsuko) turns into a multifaceted love polygon as Sentaro gets a love interest of his own and Ritsuko realizes then reveals her true feelings. 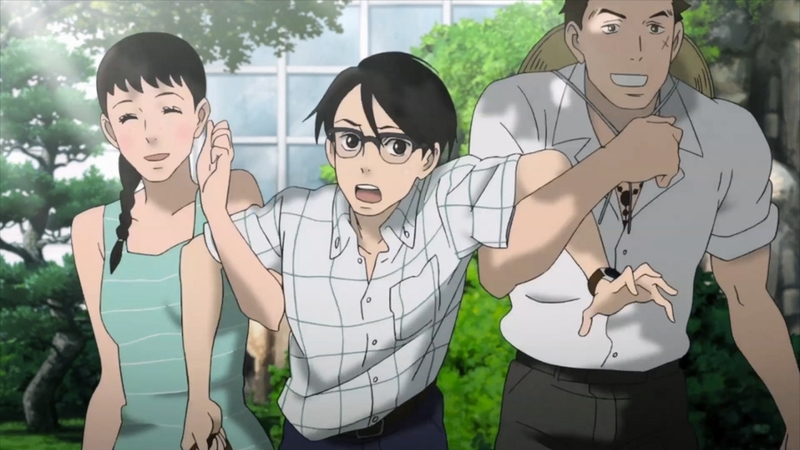 It all works thanks to the show's tangible sense of intimacy — viewers feel the characters' emotions toward each other through Watanabe's close-ups and delicate shaky-cam, Nobuteru Yuki's distinctive yet flexible character designs, and soft watercolor backgrounds from MAPPA (the new studio created by Madhouse's Masao Maruyama). Furthermore, relationships rarely stay static in Kids ; characters fall in love, suffer heartbreak, and work through their pain, coming out the other side with renewed purpose — much like real people. There is no Makoto Shinkai character here, endlessly pining away for a lover whom they will never see. It's a spot-on portrayal of what it means to spend years honing your craft with another passionate musician. Perhaps most importantly for me, Kids on the Slope is a spot-on portrayal of what it means to play music with someone — not just to jam for a couple hours, but to spend years honing your craft with another passionate musician. The experience is not unlike romance, with the long hours spent together, the sharing of secret stories, and the unspoken connection that develops between partners. It's a completely platonic connection, however, and this paradox categorizes the musician's bond as something between friendship and romance. I've experienced this firsthand through my own little band, Science & Progress. The group is basically an extension of the musical collaboration between my friend Nik (keyboard) and me (guitar). We were friends before playing together, but our bond as musicians strengthened our friendship in powerful ways. When we're at a party and there's a piano or guitar nearby, all else is paused for a moment as we sit down, wrapped up in our own little world, to make music together. In Kids , Kaoru and Sentaro barely know each other before their musical run-in, but by the end of the series, their bond is so strong that neither charater needs to speak to communicate their feelings. After having a fight, the two reconnect via an impromptu, wordless concert, which an awestruck Ritsuko describes as "two princes arguing good-naturedly as they come home." In the show's final scene, music once again forms the basis of a wordless exchange, in which we realize that these characters have shared something that can neither be shown nor told — it can only be heard. 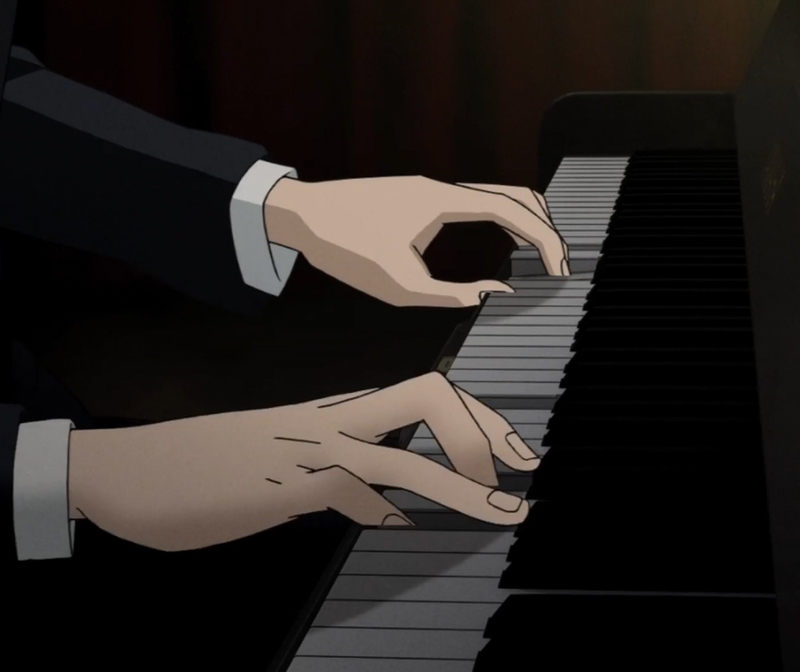 As a musician, I don't really understand the complaints about Kids on the Slope 's romantic focus. Good music isn't about notes or sounds or instruments; it's about feeling, and Kids has it in spades (though, for the record, the series also has excellent music from the acclaimed Yoko Kanno and some of the best animation of musicians I've ever seen). As I've mentioned previously, this isn't so much a show about music as it is about people who play music. There's a subtle distinction there. It's the difference between a shallow, glamorized view of what it means to be a musician and the emotional experience of a true musician. It's art supporting life. This review is based on a premium Crunchyroll stream.